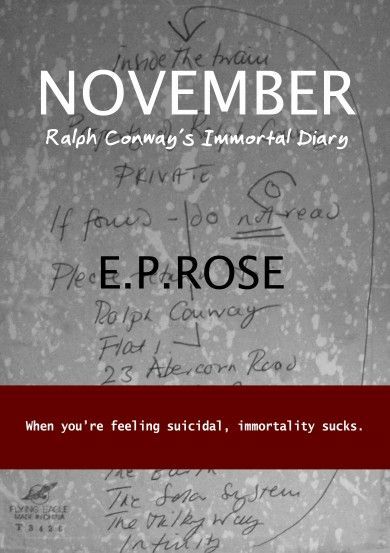 Our daily adventure continues right here with The Eighth instalment of November: Ralph Conway's Immortal Diary. If this is your first day with us, I'd recommend you click here for links to the preface and previous instalments. “Oh by the way,” said Orson, as we drove out of town this morning. “What?” I asked. I was sitting there in the passenger seat, savouring that wonderful feeling you get when you leave London after not having left it for some time. It’s a dual sort of feeling. The feeling of relief and liberation. And the feeling of panic, as of one who suddenly finds himself cut off from his life-support system. I was also experiencing a considerable sense of relief and liberation as the gap between me and Joan widened at about eighty MPH. “I’ve been thinking about it,” said Orson. Was he going to ask for it back? I found I did not want to admit to having taken it. The fact of the matter is that I seem to be a little bit ashamed of having tried to bump myself off. Orson was obviously having second thoughts about giving me that pill. Whether he feared I would take it myself, which would have been spot on, or whether he feared I would slip it to Joan – as if - I don’t know. As it was, I put his mind at rest, by telling him that I had disposed of it myself. I implied that this was the real reason I had asked for it in the first place, that now the threat of fifteen years inside no longer loomed over him, I had taken it upon myself to confiscate and destroy the offending agent of doom. I think Orson was rather touched at my concern. He responded by being concerned about Joan and me. “Supposing she dies,” he said. I think Orson was on the verge of making some rejoinder. As it was, he nearly ended up on the literal verge, as some on-coming overtaking idiot failed to take us into consideration. As our pulse-rates returned to normal, I deftly switched the subject away from Joan to the object of our journey. Orson has to find a location in which to shoot a commercial for women’s tights. Daredevil tights. They’re going to film this girl jumping out of an aeroplane wearing these Daredevil tights. The plan is that she is going to land on an island in the middle of a lake. We turned off the motorway and came in due course to Dempster. “Dumpster,” commented Orson, when he saw the sign, and summed the whole place up. You go through Dumpster, and after a couple of miles you come to Sidewood Lane on your left. You drive up Sidewood Lane, and just before you reach the end of it, you see some gates and a drive winding away up through the trees. “You’re my assistant,” said Orson. “Why can’t I just be your friend who’s keeping you company?” I wanted to know. The front door of Sidewood House was opened by a severe-looking female with grey hair, in a grey dress, with a starched collar. This person turned out later to be Aggie, the housekeeper. I was standing behind him on the crunchy gravel. To my left there were barns, which formed a kind of wing. To my right, there were trees, through which I could see a hard tennis court, with a lot of fallen leaves on it. We entered the house. Gleaming floor-boards, interspersed with rugs, led away to a glass-paned door through which I had one brief exciting glimpse of the lake, before we were ushered into Miss Jackson’s study. “This is Ralph Conway, my assistant,” said Orson. Orson was right. Alfred Hitchcock in drag. Miss Jackson told us to go take our photographs and whatnot, then we could discuss terms over a nice cup of tea. We followed Aggie down the hallway, through the door and out onto the verandah, which runs along the entire length of the back of the house. The view from this verandah is quite wonderful. We found ourselves looking out over the lake. The lawn runs from the house down to the lake, in a steep slope. At the side of the lake, there is a quaint jetty, with a little rowing-boat moored there. And on the island, in the middle of the lake, there is a small hut. This hut was not there, when last Orson came to photograph the place. He was very upset about it. But I didn’t care. I loved the little hut - and the gentle sound of water falling into the lake, from the waterfall that streamed down through the trees to our right - and the whole place. I was enchanted. “Oh, this is no problem,” said Orson. He was peering into the window of the hut. He tried the door and went inside. I followed him in. It was just a simple hut, like a garden shed. There was a table in there, a chair, and the window. The window looked out at the waterfall. “We can just take it down,” he said. He was referring to the hut. I sat on the chair and stared out of the window, while Orson wandered round the little island, taking shots with his Pentax and his Polaroid. Then we rowed back to the mainland. I slipped, climbing out of the boat onto the little jetty, and my right foot was soaked. Orson set off on a circuit of the lake, snapping as he went. I hopped and squelched onto the verandah. Aggie came and let me in and showed me into the living-room. I removed my soggy shoe and sock. She took them off into the kitchen. Miss Jackson was sitting by a blazing fire. She seemed amused by my misadventure. She told me to sit by the fire and warm my naked foot. The idea that this woman, however bizarre, should think that I was in advertising was too much for me. I told her the truth, that I was simply a friend of Orson’s, who had come along to keep him company. There’s nothing I hate more than people asking me what I do or what I’m in. Because what I do, or what I’m in, is not, in my book, who I AM. Who I am is the Great Me, and I do wish that people would see that and stop asking me what I do all the time. “I’m not in anything,” I said. I suppose I could have explained that I was a Master of Wine, who had a very good job in the wine department at Christie’s and a small roster of rich clients of my own who I advised on wine buying, until I inadvertently became an alcoholic and blew everything, but I didn’t. Some sunlight came in over the lake, across the verandah and through the French windows. I fancied I could see harmless winter gnats dancing in the air out there. I turned my attention to the fire and toasted my toes. I could feel Miss Jackson staring at me, while I stared at the flames. Aggie was standing in the doorway, bearing a tray full of tea things. She brought it in and placed it on the table in front of the fire. “Who’s it by?” I asked. She hopped up onto her feet, waddled over to the piano, took a small leather-bound volume from a pile on the top of it, and handed it to me. It was a collected works of Thomas Hood, 1799 - 1845. She handed a cup of tea to Miss Jackson. Then she handed one to me. She started to leave the room. “Well, I don’t know,” I said. This was very surprising. But I agreed. Why not? So Aggie came and sat herself on a footstool in front of my chair. She took possession of them. She bent them back and peered at them and wiggled my fingers. “I am,” I said, moderately impressed. She then explained to me that my left hand was the hand I was born with, my virgin hand - and that my right hand was the hand on which the story of my life was indelibly written. She took my right hand, palm upward on her lap, and began to study it intently. While she studied it, she continually passed the tips of her fingers over it. It was an agreeable sensation. “You mean, his father was the milkman,” said Miss Jackson, amused. Then it was as though Aggie suddenly saw something in my hand that astonished her. You can imagine how my heart reacted to this inquiry. It started leaping about and banging against my ribs. “What is it, Aggie?” Miss Jackson wanted to know. She let go of my offending hand, stood up and retreated from the room. As she exited, Orson entered, in his stockinged feet. In the event, I poured a cup of tea for Orson, while he launched into his location-finder spiel, explaining how he’ll have to show the photographs to the director and the agency producer and the copywriter, and that if they like them, then he’ll have to bring them down to have a look at the place. Which, more or less, brought the conversation to a close. We said our goodbyes. Orson rejoined his shoes on the verandah. Aggie brought me my sock and trainer from the kitchen, where she had successfully managed to dry them out. She hastily put the cups back on the tray, which she gathered up, and bore away. I stood up. Miss Jackson stood up. She was a good head or two shorter than me. I looked at my right hand. Miss Jackson looked at it too. I put it in my pocket. A toot told me that Orson had made his way round the side of the house and was now waiting for me in the car. Miss Jackson picked up the Thomas Hood and walked with me to the front door. By “this”, she meant the Thomas Hood. She said it was a pleasure, wished me au revoir, and I climbed into the car. I fell asleep on the motorway and woke up when the car stopped and we were back home in London. Orson went down to his flat. I went up to mine. The bloody television has broken down. Can you believe it? But more than that, I am now sitting here in the kitchen and I find that I can no longer dodge the following vital question: Am I immortal? And if so, what am I going to do about it? What AM I going to do? I love that this was such a lengthy chapter. Check back tomorrow for The Ninth.